History: 'Clarity' is believed to be one in a series of 4 sixes built by Thornycroft to a single Fife design. She took part in the 1926 Scandinavian Gold Cup. 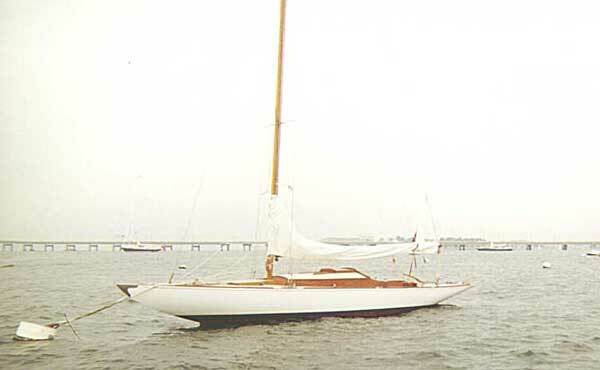 It is currently unclear when she came to the USA, and her history is unknown in this country until she was purchased in Maine in1980, by a gentleman who lavishly restored her in preparation for the1983 America's Cup. His intention was to have a beautiful boat from which to survey the regatta. Unfortunately, on the way back from the restoration shop in Pennsylvania, a strap loosened and she bounced on the trailer, sending poppets through her hull and breaking many frames, so back into the shed she went, otherwise shiny and new. 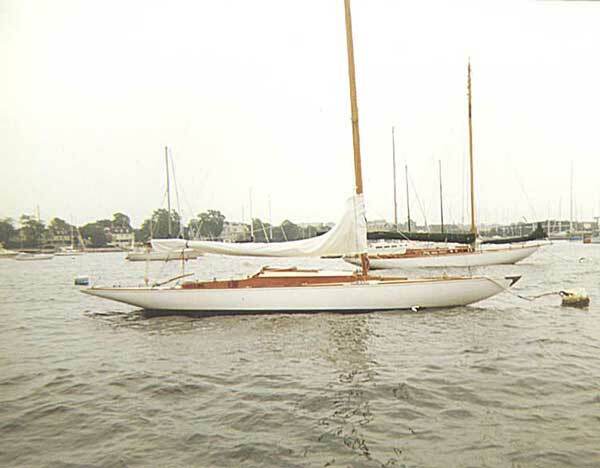 She stayed there for 15 years while her owner completed a restoration project on his turn of the century Herreshoff designed New York 30, 'Amorita' (seen in the background of the first 2 images below). Clarity hit the water again in 1998 only to meet another near disaster. 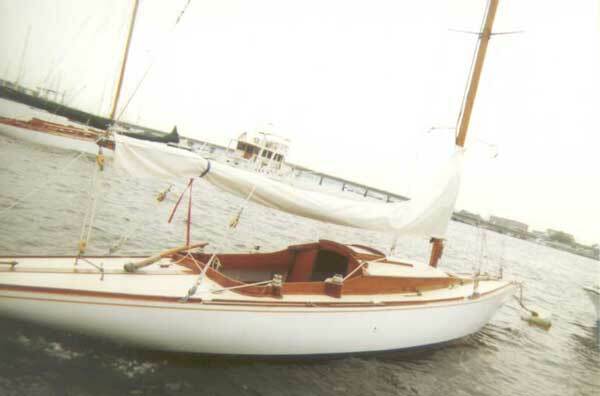 While taking part in the Newport Classic Regatta, she was hit by a port tacking Concordia yawl who never saw her. She was split open mid-ship nearly to the waterline also taking down the rig; she nearly sunk. It took another 2 years before she hit the water again in Summer 2000. If you know any of the pre-1980 history of this beautiful boat, send me an email. "Bonzo was ordered for design in 1923. It was made for Wm. Vett. of Copenhagen Denmark. It was Fife yacht Number 722. Its tonnage rating was 4." 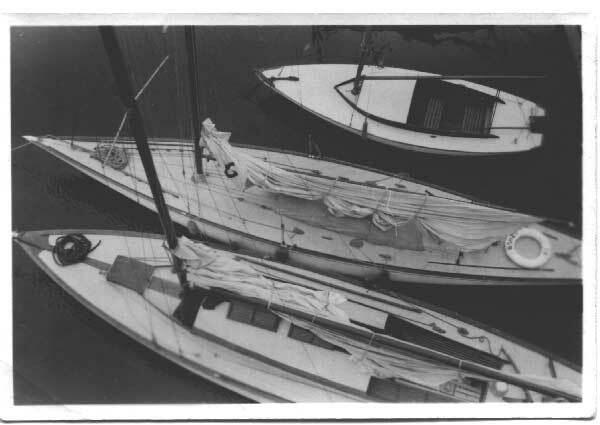 "My father, Georg Larsen, sailed on Bonzo during the 1930's and early 1940's, when she was owned by Jens Jespersen, a Master Cabinetmaker in Copenhagen, Denmark, and one of the founders of Kastrup Sejlklub (1927). I believe that Mr. Jens Jespersen built the enclosed cabin of this boat, which was originally open. Somewhere, I have original black & white photographs, taken during those years. 6D22 "Bonzo" Built 1924 - Mr. Vett sailed "Bonzo" to win a Silver Medal at the Olympic Games in France in 1924, with a crew of Knud Degn and Christian Moller.